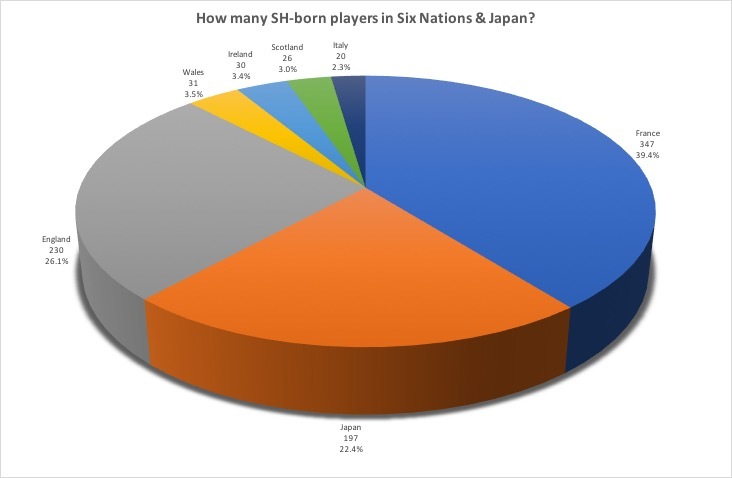 Just going to post a few graphics based on some player research I did across teams in Six Nations and Japan. 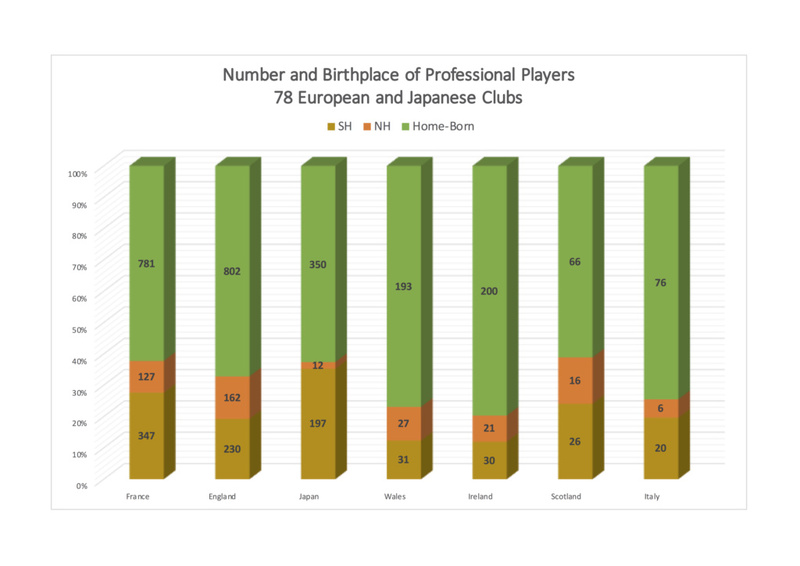 I haven't included any data on French or Japanese academy players as they're not easily available. The figures are birth-countries only. So a player may have moved when they were 4, 14 or 24. It also includes players whose parents are from another country, has different nationality grandparents, etc. It includes players from PRO14 Championship, English Premiership, English Championship, French Top 14, French PROD2, Japan Top League. Pot Hale, do you know how many NH coaches ply their trade in the SH? Probably not many, maybe zero. And I’m kinda glad that’s the case. Although Farrell seems like he would have something to offer. Guns, have you heard of Joseph Stiglitz? He said Ireland’s decision to appeal the European Commission’s €13 billion tax ruling against Apple and the Government’s apparent slowness in retrieving the money have damaged the country’s reputation internationally. Oh look - more irrelevant tax stuff masquerading as a rhetorical question about coaches. Have you looked at the life-experience of coaches and where they've learned their trade during their career? Have you looked at the successful club teams and who they are coached by? Have you looked at the number of opportunities to coach and where those opportunities are located? Collapse - I've set up a separate thread for you and bop to argue about tax havens and any other irrelevant topic that you want to pursue. Would you mind taking the conversation over there? Pot Hale wrote: Collapse - I've set up a separate thread for you and bop to argue about tax havens and any other irrelevant topic that you want to pursue. Here's a thought why don't you target your silly smart arsed threads at the person who actually started the conversation. Here's a thought why don't you target your silly smart arsed threads at the person who actually started the conversation. Bell end. Yes of course, it had nothing to do with you. I didn't say that. I asked you to direct your smart arsed comments to the person who initially derailed your thread. I withdraw the bell end comment. Well you can only pick 15 players at a time. IE Scottish couple moved to New Zealand, had their children and one or a couple of the children have returned back to Scotland or to the UK. 2. Are these foreigners, people who have been in the country since childhood or a very young age due to their parents moving here? 3. Are these foreigners, rugby players simply here for the big money. 4. Are these foreigners people who came across to better their lives, working in other jobs or in the Armed forces etc, who then took up rugby and progressed. Stats are all very well but don't always tell a great deal...just like straight stats on a rugby pitch don't always tell the performance of a player. 5. Is 'foreigners' including people who have moved around within the UK, and who wouldn't consider themselves to be living in a foreign country in any real sense? Pot Hale wrote: All good. Can you explain what the numbers represent in this one, please Pot? Is it the current number of pro players playing ‘abroad’? Is it just those playing in premier competitions and not in the next tier down? The reason I ask is because I know a lot of Wales players have gone from the Pro14 to the english championship (2nd tier) and last year the figure (reported by the fail) was in the 80s. See my OP for answers to some of the above. I don't know the personal motivations/perceptions of any player obviously. 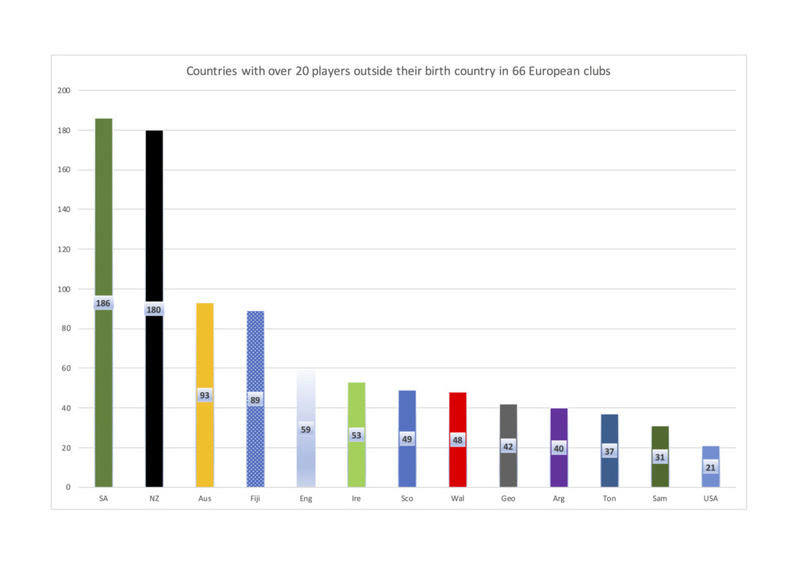 They are based only on where players were actually born drawn from published data. I can't testify to the accuracy of that data, but it includes wikipedia listings for each club, as well as union and club websites. In PRO14, Premiership, Top 14, PROD2, Top League - see my OP above. 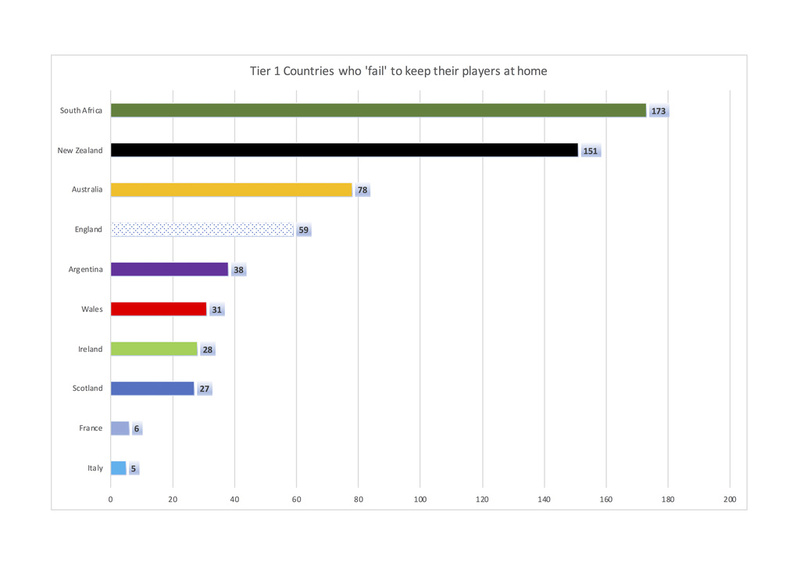 With Pots figures it would be the most likely max number of players from a country. 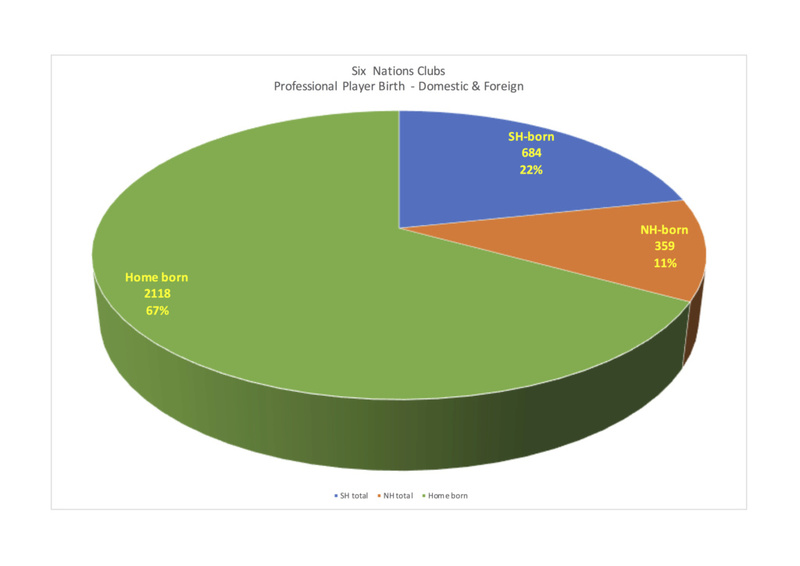 For the 'home' nations the number of none born players is probably lower figures. Thanks. In that case I think the figures are a bit misleading/under reporting the thing I’m talking about. I’m not advocating including ALL players who leave one country to go to another (and I wouldn’t want you to do that bit of desk research - it would take forever! ), but as I say there are certainly examples of players leaving the top league in one country to go to the 2nd tier of another so they’re ‘lost’ to the original country just as much as any others player, and lost to the stats quoted here. An example is when Bristol were in the 2nd tier. We had pro players such as Gavin Henson, Jordan Williams, Ian Evans, Ryan Bevington, etc - all pro regional players (and international players) - ‘lost’ to Wales but not accounted for in the stats. 3 of them have come back now and one has moved into coaching (funnily enough all at the Dragons), but there are players from the regions at the likes of Ealing, Jersey, Bedford, Doncaster, etc. I guess all I’m saying is that the stats don’t paint the full picture of the losses. It’s because of the strength (financially) of the English 2nd tier where a player can probably still earn a good salary even though they are not in the top flight. Also while we have been hard on French clubs activity getting PI players Fiji's rise has been mainly down to the T14. They have kept their flare but have learned structure aswell. It looks like Samoa who have the most players in SR or the tier below it M10 etc seem to be the worse. Is it by chance. Thanks for that Oracle. I haven't done the Championship so I take your point as it is full-time professional same as the others. So I'll work on those and update figures accordingly when complete. Would that address the anomaly/under-reporting you're talking about or are there other players missing? Sorry Pot, not a criticism of your stats per se. More an observation that, for somewhere like Wales with its close proximity, the English 2nd tier is a draw for some of our pros too. I’m guessing the other nations are ‘poached’ to that league too so might not change the stats much. Edit: just saw your last line. Yes I think it would. But I expect there are Scottish, Irish, NZ, SA, Oz players there too so might not do anything to change the ‘gap’ between the NH and SA losses in the stats. Didn’t consider that when I first posted. The Oracle wrote: Sorry Pot, not a criticism of your stats per se. More an observation that, for somewhere like Wales with its close proximity, the English 2nd tier is a draw for some of our pros too. I’m guessing the other nations are ‘poached’ to that league too so might not change the stats much. I just had a quick look at London Irish's squad and academy - it would make your head sore with the amount of different nationalities in it!! Other teams are largely English players - but yes it will increase other numbers too - although at a quick glance - mainly NH-born players e.g. Hartpury College RFC has 42 players - Wales 2, Scotland 2, USA 1 and NZ 1 plus 36 English. But 1 of the Welsh players was born in Plymouth, and the American born in Taplow. I'll see how I get on. ebop wrote: And people on here say the gap is closing? Ummm, only because of the influx of players, coaches and IP. Really? Do you remember Murray kidd? We have quite a few southerm hemisphere coaches in the English Premiership. However, last year, the top four teams were coached by an Irishman, a Welshman, and two Englishmen. The last New Zealand coach to win the Premiership was Warren Gatland in 2005, which seems like a long time ago. There are three New Zealand coaches in the premiership right now, and those three teams are currently in the bottom half of the table. For all the talk I see on here of New Zealand giving "rugby IP" to England, there's really not a great deal of evidence the Premiership gets a boost from that source. Certainly, players like Nick Evans at Quins, and Jimmy Gopperth at Wasps are local heroes but, in terms of Premiership impact, English supporters are probably more aware of South Africans and Australians. John Mitchell is with the national set-up now but he's largely seen in England as someone who New Zealand wanted as head coach because he'd learned his trade over here, which was a case of "rugby IP" moving in the other direction. Largely seen by who? Never heard that one. Plus he was useless. Being taught his trade in England makes complete sense. Possibly the worst coach I ever watched the ABs under. Didnt even know he coached there. Shows how poor the local coaching was I guess. Desperate times huh? They probably just dialed any nz phone number and asked if theyd coach the side. Yeah that's what happened. Of course you didn't know. You don't know anything about Irish rugby. Couldn't be more obvious. Collapse2005 wrote: Yeah that's what happened. Of course you didn't know. You don't know anything about Irish rugby. Couldn't be more obvious. Whats there to know? After over 100 plus years it all got a bit tedious. Why are we even bothering? I know, we’ll start sending players and coaches over, then theyll start being more competitive. Georgia? That might be another interesting little venture. You probably wouldn’t know Ireland’s record during the 90s, Tman, but let’s just say it was the direct opposite of NZ’s current winning record. Lost to every team imaginable. Could hardly score a try let alone win a scrum. Dreadful dreadful games. They had players from all over the world and it didn’t make a bit of difference. Coaches from New Zealand, England, Outer Hebrides - woeful. And then the IRFU went professional in 2000, Eddie O’Sullivan came along and saved us. Kidney put the icing on the cake and after that it was plain sailing. Schmidt then raised the bar again. The nineties.... who can forget them. Yeah 90s werent great for us either, far too inconsistent. Oz and at some points SA were on top then. We still had the north south divide, Hart vs Mains and Grizz, and Mitchell was just awful. We also had a few years of so so forwards. Journeymen from the south like Taine Randall, Thorne, Blackadder etc etc cant even remember the locks. Wasnt till Henry and Wayne Smith took over that things changed for the better. Taylorman wrote: Yeah 90s werent great for us either, far too inconsistent. Oz and at some points SA were on top then. We still had the north south divide, Hart vs Mains and Grizz, and Mitchell was just awful. We also had a few years of so so forwards. Journeymen from the south like Taine Randall, Thorne, Blackadder etc etc cant even remember the locks. Ah, Tman, I know you like to spruik NZ whenever possible, but I'm sorry - when it comes to losing during the 90s, Ireland knocks New Zealand - and every other team - out of the park every single time. When I say we lost, we lost with wild abandon, voraciously, wildly, indiscriminately, maybe even calculatedly. When I say we lost, we lost brilliantly. Only a 31.25% win record. Out of 94 teams in World Rugby, we had the most losses - 54 defeats in total. We were Kings, man. New Zealand - worst losers for the period. And so it continued until finally in the last couple of years, Ireland reached its nadir surpassing even New Zealand as the worst losers for the period 2017-2018. Taylorman wrote: Largely seen by who? Never heard that one. His whole coaching career started in the North so, yes, we'll take the blame. When he went back to New Zealand, he said he wanted to improve the standard of New Zealand forward play based on what he had learned with England. Woodward said at the time he wouldn't be surprised to see the All Blacks tap into his knowledge for the national set-up. Don't think we expected to see him get the top job so quickly either. There are plenty of examples of coaches being excellent in one role but not necessarily suited to a top job. In England, Andy Robinson (forwards) and Brian Ashton (attack, player development) were not as effective as national coaches. In New Zealand, you could point to Wayne Smith, who didn't thrive in his stint. Andy Farrell will now be a high profile case study. I don't know about John Mitchell's value as a coach nowadays but players enjoyed working with him in Woodward's England set-up. He said Ireland’s decision to appeal the European Commission’s €13 billion tax ruling against Apple and the Government’s apparent slowness in retrieving the money have damaged the country’s reputation internationally”. Have you looked at where those coaches learnt their rugby? If you’re implying the NH system is making SH coaches (that are in the NH) the coaches that they are then why doesn’t the NH system create NH coaches capable of coaching national sides? NH clubs/nations are leeches. For example, do you think Ireland shaped Schmidt as a person? His passion for rugby? Don’t think so. Some idiots on here actually think he’s Irish. The tax thing is relevant. Because Ireland rugby bludges off the SH community and the Ireland economy bludges off the international community by being a dodgy tax haven by stealing tax money that doesn’t belong to them. Parallels. Well, it might be more a case that national unions aren't selecting them, rather than the systems not creating them. For instance, the RFU hasn't selected a coach straight from the English club league, since Woodward over 21 years ago, when the game had only just turned professional. When the RFU decided that he next coach after Lancaster should be someone with international experience, Rob Baxter of Exeter pointed out that this excluded candidates who had earned their stripes in the English club game, despite no-one with that background being to blame for any of the failures at national level. France have not yet appointed a foreign coach. They have been desperately inconsistent during for years now, but Lievremont was coach, nominally, or otherwise, when they made the 2011 World Cup final. France and England combined have made the final six times out of the eight times it has been held, and it's been a northern hemisphere coach each time. Yeah, NH unions are gun shy and it’s hard to know why. Wales have had a string of kiwi coaches since a long time ago. Ireland are similar and had Gatland (dud), local duds and then Schmidt. Scotland were a laughing stock for decades until Cotter turned up and now they have a local in charge that is continuing the work. England were the last bastion of self-belief in Britain/Ireland but even they crumbled and took on an Aussie. Personally, I think a kiwi would suit the English character more than the American style brash Australian swagger. Often wonder if you guys cringe a bit when Eddie opens his gob. But why even bring in Eddie? Like you say there are good coaches in England and they must be given the opportunity to lead and develop succession plans with the union for the future instead of stumbling from one era to the next based on chance and foreign coaches available at the time. The RWC2015 should have been the epiphany like what NZR had when they didn’t fire the coaches after the 2007 debacle but gave them another shot. That opportunity was missed for England and if the next England coach isn’t English then that’s criminal. Think I agree. There are a few difficulties, though. Firstly, I think most New Zealand coaches struggle with the Pemiership, at least initially, because it is such a different beast from Super Rugby. If you are a Director of Rugby (like Todd Blackadder), your main challenge is assembling and keeping a squad which can fight on three fronts, including periods when you lose your top players to international duty. That's a logistical challenge more than a coaching challenge, and not really a set of skills you need in New Zealand, or at national level. Also, given what the English media can be like, you wonder whether more reserved characters would put up with it. New Zealanders are no shrinking violets but your family can get dragged into it, which a lot of people would find unacceptable. Would Joe Schmidt have been able to deal with the difficulties of raising his son, and also the sniping of the English media? I can imagine him walking away. The record of New Zealand sides in Super Rugby would suggest that's where the coaching nous is but Australian and South African coaches seem to fare better in the English Premiership. Rennie with Glasgow had the same problem. Glasgow in the league were great but he forgot it was a longer season so the team fell apart at the end. Add in he had no idea how to adapt to the Champs Cup. Super Rugby is an easy season with a nice rest before the business end of the season. Add in smaller squads that are more mono-cultural and you can see why they struggle up NH where finishing in the playoffs, Champs Cup spots or bottom half all have different consequences. And the stars aren't always there to bail you out. This season Rennie is learning rotation which is an art in the Pro 14 due to the complexities and the high level to which it is done. Only at the end of the season will we know he has improved enough. Set piece is also much more important so tactics don't always convert over. There isn’t a SH ‘community’ - only in your head. There isn’t a NH system either. There are individual countries and unions with differing objectives, national systems, ownership structures, financial strengths, playing resources, etc, etc. You seem to think that everything stems from NZ and if it doesn’t, it’s a dud. That’s your opinion. Fair enough. What was it, 604 SH players playing top club rugby in the NH? That’s quite a lot of players. SA and NZ being the main contributors. Do you reckon Ireland will go through a boom/bust cycle like Australia after Schmidt leaves given rugby isn’t a big sport in your country? Schmidt is cutting and running. Best Ireland coach ever. Also, is having foreigners coaching your club sides good for long term success? Lancaster at Leinster for example. I’d like to see an Irish person coaching the Ireland team and then we’d really get to see what they’re made of. Do you reckon Ireland will go through a boom/bust cycle like Australia after Schmidt leaves given rugby isn’t a big sport in your country? Schmidt is cutting and running. Best Ireland coach ever. Also, is having foreigners coaching your club sides good for long term success? Lancaster at Leinster for example. The coaches in the Six Nations (the NH as you dub it) are readily identifiable - and yes I know there are 2 NZ coaches amongst the 6 of French, Irish, Scottish, Australian and Kiwi And plenty of other nationalities amongst the various coaching groups. No, it’s not 604 SH players playing top club rugby in the NH. 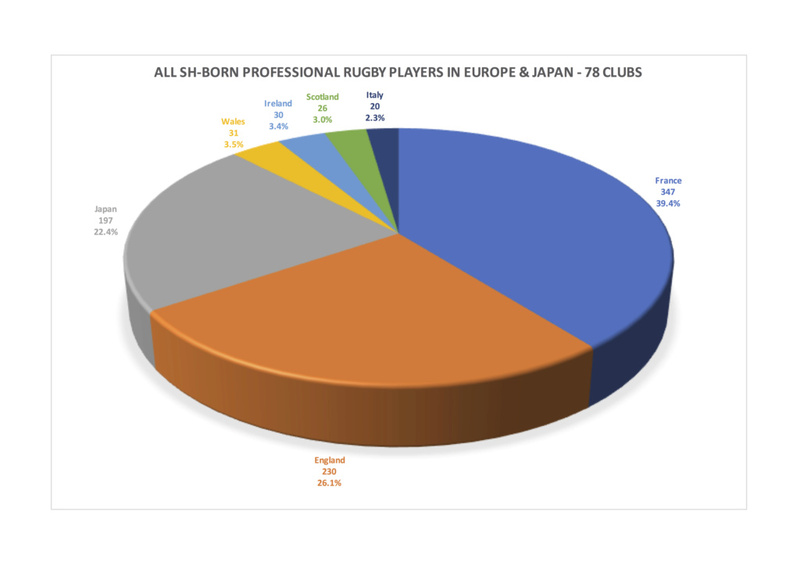 It’s 604 players born in Southern Hemisphere countries as I outlined above playing in PRO14, Premiership, Top 14 and PROD2. As I’ve indicated in graphics above, there are 12 NZ-born players in Irish rugby. Part of 32 players who are SH-born. Five years ago, there were over 50. The numbers have been dropping each year as contracts finish and more academy players come through from the 75-odd players in the academy system each year. Of the 12 NZ-born players, one moved because his wife is Irish and wanted to try a new opportunity, another whose parents are Irish and moved here at 11, others with Irish grandparents, 2 more who grew up in another country and one of them capped for Australia (Tomane), and I think 3 who are not capped. The long-term plan is to have only Irish-qualified players in the four provinces with maybe one or two already capped (NIE) foreign players - although these have been dropping too - the allowed NIE quota is 12 but only 6 slots are filled. NIE contracts can’t be renewed so that’ll see players like Fardy, Coetzee, and Taute being let go at end of season. There are no ex-ABs full-time in Ireland, only Alby Mathewson on a three month injury-cover loan from Toulon. The Irish provinces have head coaches from England, Ireland, South Africa and Australia. Andy Farrell’s wife is Irish, has family links to Ireland himself, and is highly respected by the players. 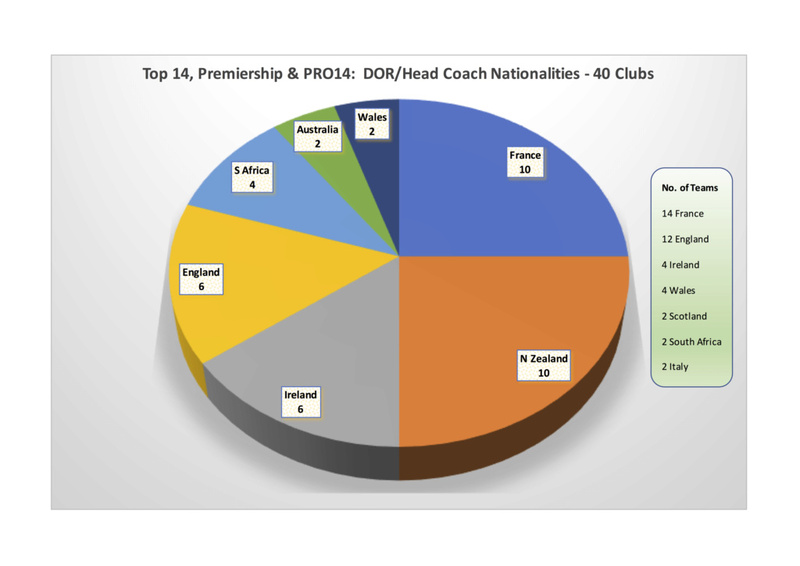 His taking over top spot is part of a long-term plan around development of a cohort of Irish coaches who are cutting their teeth in Ireland and abroad - England, Wales, France, Italy, New Zealand. The long-term plan is to have some of these in place by RWC 2023. To say that Schmidt is cutting and running is so far off the mark and disparaging of the man that I don’t think it’s worth any further comment. I think that the long-term planning that has been put in place by the IRFU around player and coach development should mitigate any possible drop-off following Schmidt’s departure after the RWC - we shall wait and see. NZ & SA do provide alot of players but when you look at the % isn't massive. Coaches like Gats who did Connacht, Ireland, Wasps before heading south. I guess his year in the SH changed everything for him even though he was multiple euro winner. Woah. No they can't have Jones back yet. Thing is it does come down to money as pretty much everyone has said. If new Zealand at all had it we'd see all the players moving over there. No 7&1/2 wrote: Woah. No they can't have Jones back yet. Thing is it does come down to money as pretty much everyone has said. If new Zealand at all had it we'd see all the players moving over there. 64 professional teams in the Six Nations with job opportunities. 5 teams in NZ. No contest. The Oracle wrote: The ONLY reason NZ coaches have been successful in the NH is because they’re miserable f**kers. FACT. Gatland, Mitchell, Hansen, Henry, Cotter, Schmidt - 3 smiles between them since 2000. It’s a trait that seems to get the best out of players though. It’s similar to the strange over representation of hard faced Scottish soccer managers in the Premier League! So thanks for sending us your miserable f**kers! Guess you missed the ‘If’ huh? Nope, Tman. Doesn't matter how much money NZ had - there's only 5 teams to accommodate all the European born players. Or did he mean all the NZ-born players moving back again? 151 would be easy enough to accommodate. Ireland have four professional teams but don't have a massive playing pool just like Wales, Scotland and Italy. Their player bases are growing as is income, so as they produce more home grown players they will need less imports so less SH players needed. Academies are starting to produce so more young players reaching the standard. France have 14 professional teams in the T14 and 16 in the ProD2. That's 30 teams in total. By 2023 they want to have 3 professional divisions. Is it surprising that they take so many non-french players when they need 1500 (30x50) professional players. England have 12 in the Prem and 12 in the Cship (though not all professional I think). Even if 20 teams that's 1000 players. Do we think that SH players should rot on benches get less than 10 games a season worrying season to season where they would be in 12 months time. If a French or English club in one of the two divisions shows up offering you more money for more games and will give you 3 years stability, should players think of their loyalty to country and reject it. Or should clubs just hired lesser players to be professional. Oz had to cut a team and so 20% of professional players in Oz had to decide where to go. NZ may have to look if they can afford to run 5 high level professional teams. The choice may come in the next 5-10 years do they want 5 average teams or 4 high level teams. Funds might not be there to support the current levels. SA might be able to support 8 teams by have 4 NH and 4 SH teams bringing in three pies (SR, Pro14/16, Currie) rather than dividing up one pie between lots of hungry mouths. Good comments, Brendan. Agree with a lot of that. England, France and Japan have the team capacities to be able to absorb a lot more players - no question. There are 715 players across Wales, Ireland, Scotland and Italy. There are 690 alone in the Premiership, not counting at least another 300 in the Championship. 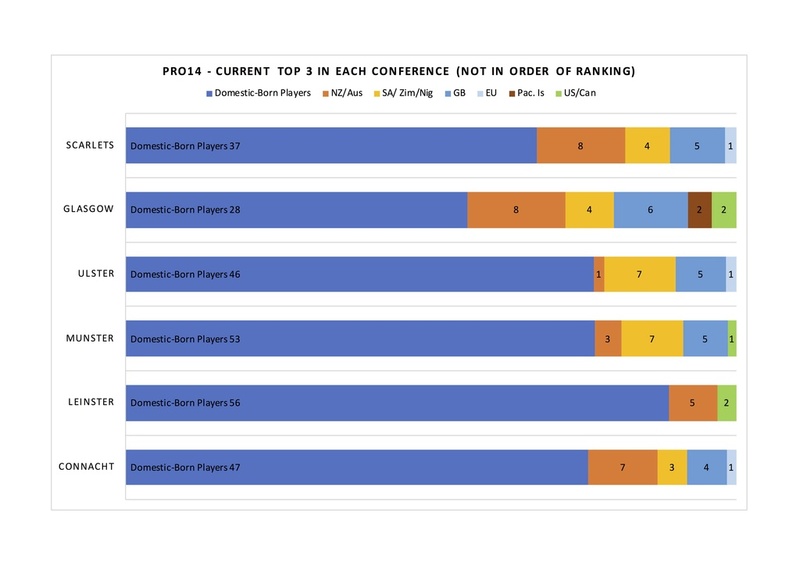 I was just looking at the make-up of the top 3 teams in each of the PRO14 conferences. income of Unions who funded teams and what the funding breaks down to per team. Some Unions can't step in to increase funds because they just don't have them. UAR can't find but Is alot less than Italy and getting money off WR. Yeah it does. ‘Had it all ‘ can easily be interpreted as having a scenario where whatever it takes means players would flock as they do now. So yeah,they would.